Lighting giants Philips showing off some OLED panels, part of a new product line called Lumiblade. OLED stands for organic LED, which uses carbon-containing organic materials as the light-emitting regions of a diode, as opposed to a regular inorganic LED which uses solid semiconductor layers throughout. The organic materials may consist of small molecules, phosphorescent materials, or electroluminescent polymers, such as polyfluorene, which have the ability to emit light when injected with electrical current. To be honest, organic chemistry is completely foreign to me, but the essential features of these materials is that when electrons get inside them and then lose energy, that energy takes the form of visible light. 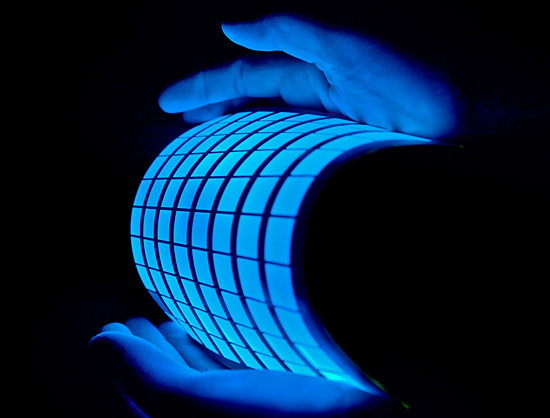 A benefit of OLEDs is that the light-emitting organic material may be coated onto large areas and flexible surfaces. Since some of these organic materials come in liquid form, the coating and processing could be done quickly and easily through processes such as inkjet or screen printing. Also, the light generated from an OLED is naturally diffuse and evenly distributed across the entire surface. For regular LEDs, the same result would require many individual LED elements plus diffusers or other optical elements to spread out the light. Because the OLED panels may be scaled to size, and because they are so thin and lightweight, it makes them ideal for portable device displays such as cellphones and digital picture frames. Samsung employs a matrix of RGB OLED arrays for its Galaxy phone line, which they call AMOLED (active matrix organic light emitting diode). The biggest drawback of OLEDs is they are less efficient compared to inorganic semiconductor-based LEDs, don't last as long, and are still very expensive to produce. Because of this, they will likely never replace regular LEDs for most lighting applications. You can buy Lumiblade panels here. If you're really DIY, play with your own monochrome OLED display from Adafruit.